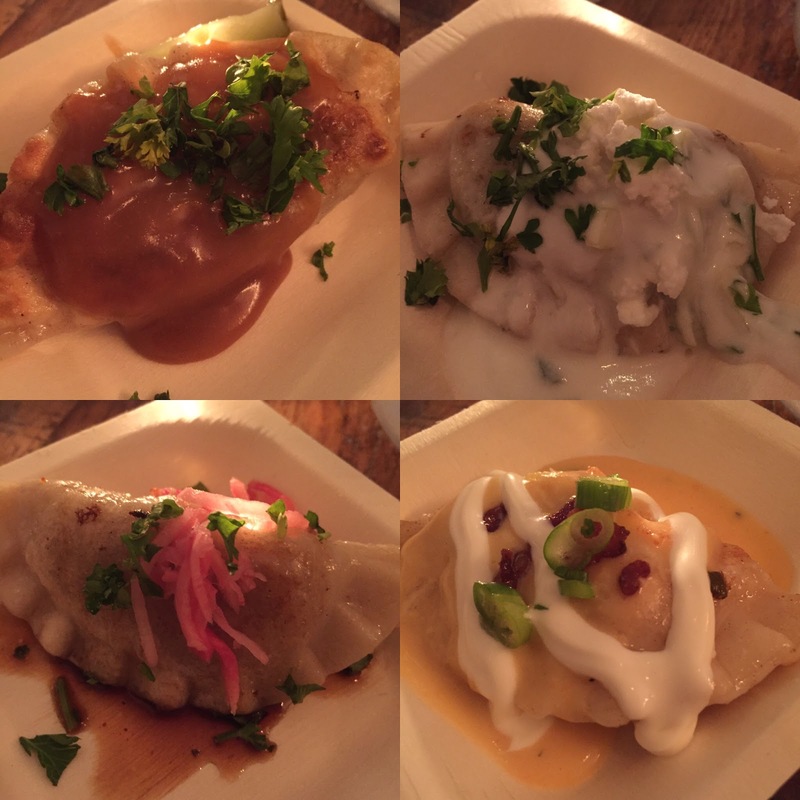 The delightful people at The Saucy Pierogi have expanded their amazing menu. In celebration of their 1 year anniversary of their bricks and mortar location, they invited some super cool people to try it out. I know what you're thinking, only 1 year? I said the same thing. Their food is timeless, feels like it's been around forever! I'd only had their food at pop ups, so this was my first time here. It is a great space, high ceilings, cool bar, lots of seating. 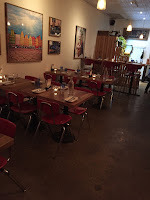 It's a great venue for a date! 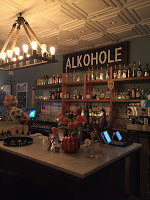 Great prices and a relaxed atmosphere. And if you REALLY like the food(and you will), there is a fridge with frozen pierogies for you to buy and make at home. MmmMmm. Let's get eating! Salad to start, of course. We tried 2 salads, Tomato Salad and Cucumber Salad. You really can't go wrong with either of these. Fresh tomato and feta topped with balsamic or crisp, thin sliced cucumber mixed in a sour cream and dill dressing. So refreshing! Pierogi time! 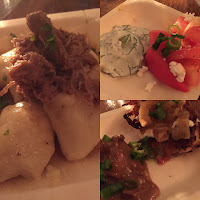 We sampled 4 different pierogies: Spinach & Feta, Cheddar & Potato, Duck and Braised Beef Shank. The Braised Beef Shank was always my go-to at popups, but now it's got some serious competition. 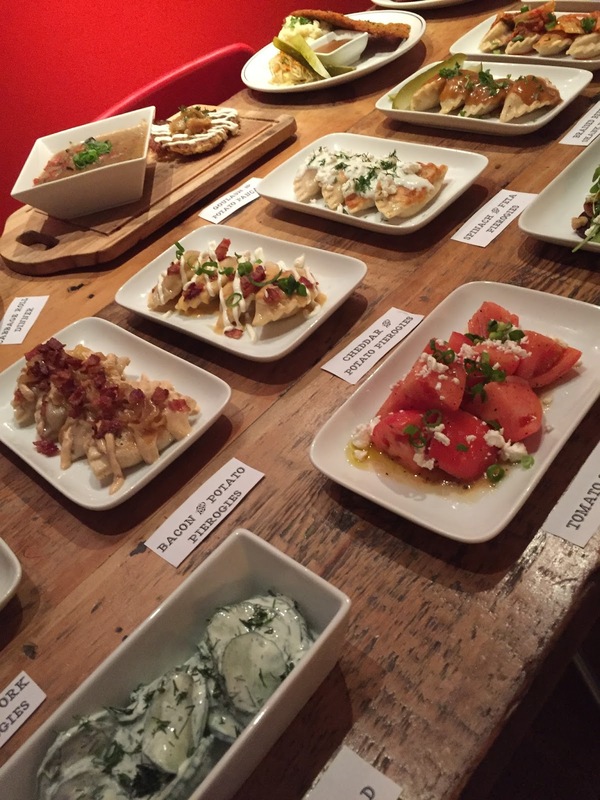 The Spinach & Feta was almost bursting with spinach and smothered in a house made tzatziki sauce topped with feta. A great vegetarian option! I'm a huge fan of duck. It was tasty topped with a sweet and sour soy sauce and radish slaw. Yum! I didn't expect the standard Cheddar and Potato to be THIS good. Sprinkled with bacon pieces, a little sour cream and a lager cheddar sauce made these 'standard' pierogies shine. 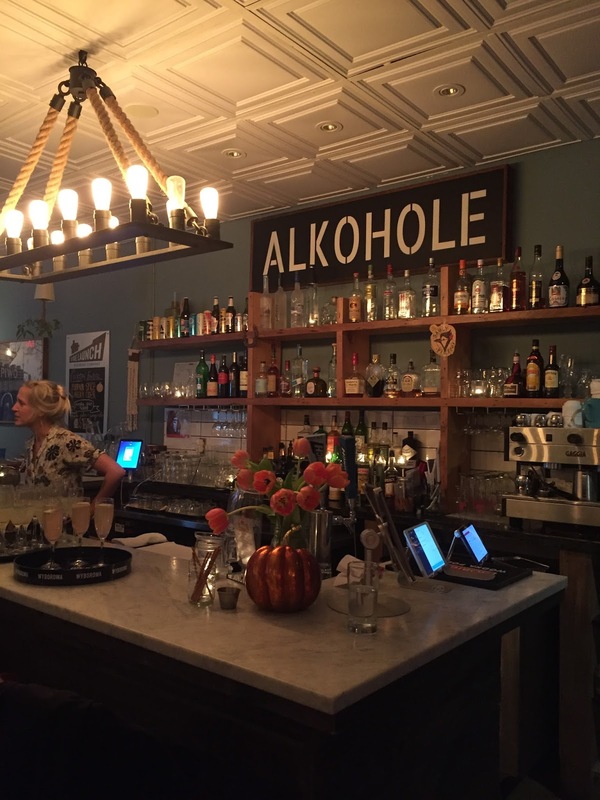 They've added even more European flavour to their menu with Cabbage Rolls, Schnitzel, Goulash, Potato Pancakes, Polish Gnocchi and more. We got to try a couple of these. The Goulash with Potato Pancake made my day. Perfect for the fall weather, the goulash is something that makes you feel all warm. The Potato Pancakes were exactly like my Nan makes, but they took it a step further by topping it with caramelized onions. Loved it! 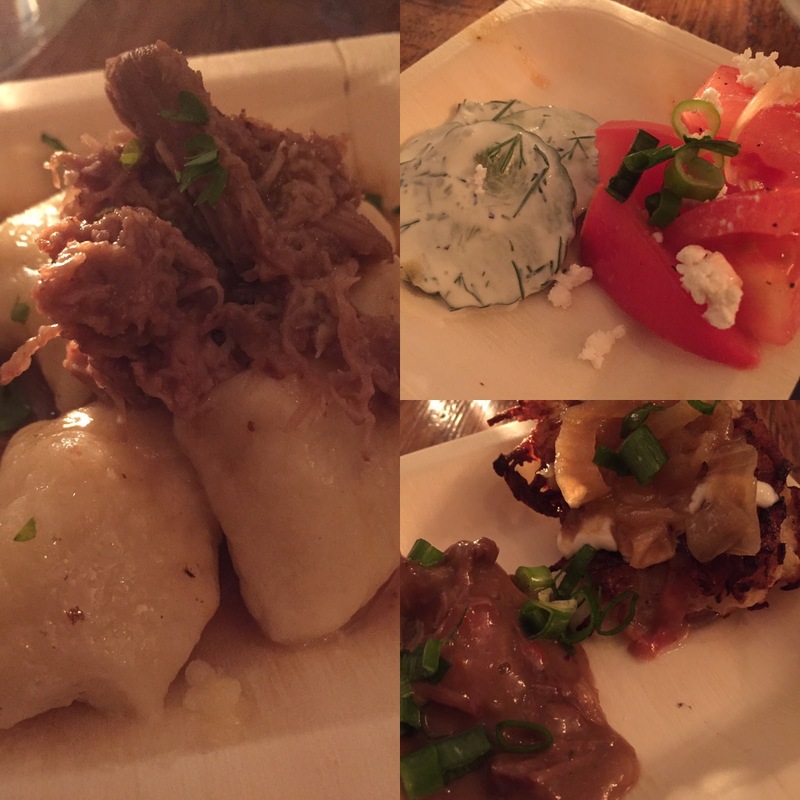 We also tried their Polish Gnocchi. I'm used to Italian Gnocchi, so I was surprised that they were filled with potato. It was almost like a mini dumpling that looks like gnocchi. Topping it with braised duck pretty much makes everything even better. 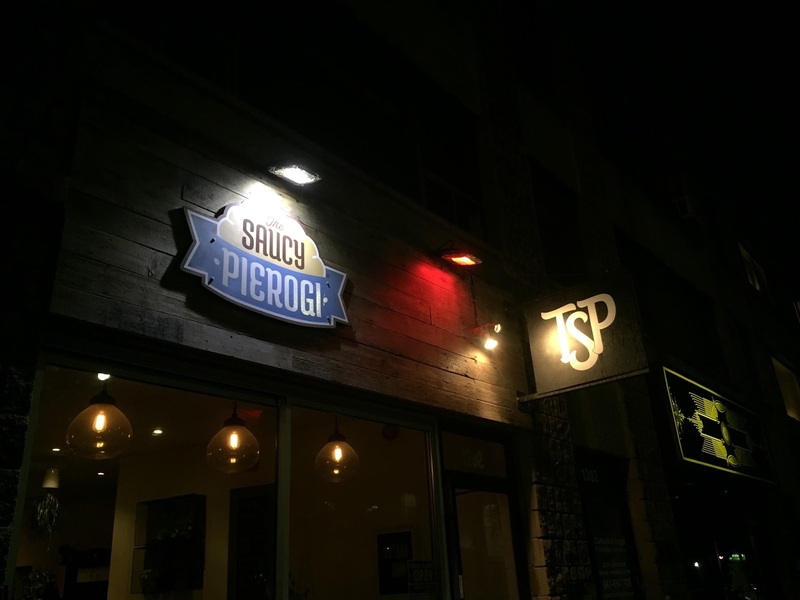 I can't thank The Saucy Pierogi family enough for inviting me to their event. It was delicious! It's always a pleasure to meet the people behind a business and find it is run by good people. I'll be back.....but I'll wear stretchy pants next time.